This is mountain day, short and tough. Rolling in on the first 10 km you will already be able to see this morning' s destination, the bald head of Mont Ventoux overlooking the Provence. I generally recommend to start early, but on this day I would encourage you to take my advice seriously. The start will be easy, good to get back into the flow after a day away from serious riding. There is a lot of vegetable farming north of St Remy, we will pass through rather quickly in the main road. Beyond Noves, the track crosses the river Durance in a somewhat complicated way as this is also the access to the main motorway. 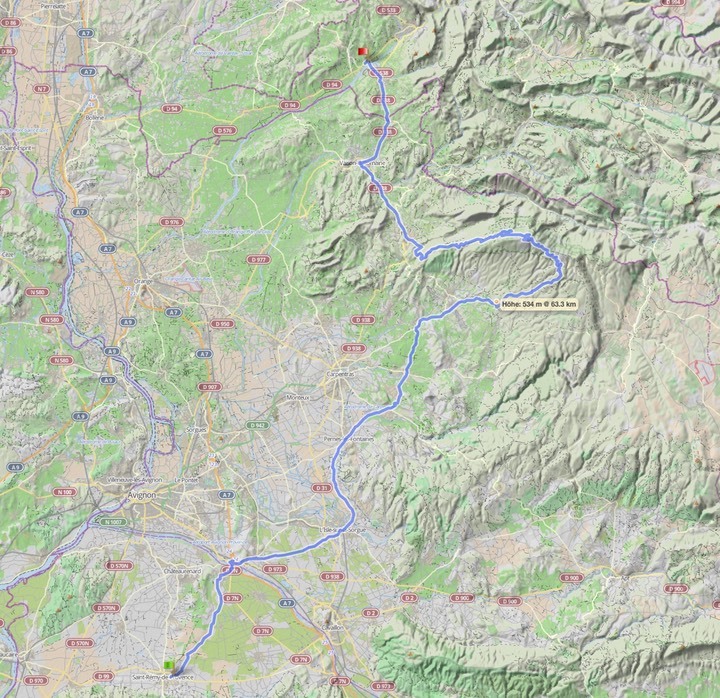 Beyond L'Isle-sur-la-Sorgue, about 30 km into the ride, we will meet the first gentle hills. It will be another 20 km or so before the climbing becomes more steady. If you want a coffee and refreshment stop (or fill up on water), I recommend to make a left turn when approaching Bédoin, the last town before hitting the mountain, about 60 km into the ride. From there on you will find a steady climb of 8-10% for the next 15 km. Almost all of the day's 2.246 m of climbing will be done on this stretch. That is the challenge; it is just up with no flat sections or downhills, as straightforward a mountain pass road as possible. The sun will be burning as we ride up the flank that is exposed to the south. You will rarely be alone, though, as this ride is among the most popular climbs for cyclists. Expect to Sea and meet a lot of riders on the way up (less so on the way down as the other side is less frequented). Luckily, there are trees providing some shade for about two thirds of the way. At 1.400 m you will find a rest stop and parking lot. It marks the end of shade as the remaining 3 km lead across fields of stone. Once you get there you will know that the summit is near, and soon enough you will see it. Obviously, we will stay on the top for a while, enjoying the spectacular view and celebrating the effort. As the name suggests it is always windy up there and could actually be a bit cold. Be careful on the way down not to overheat the brakes as we go down 1.500 m; better to stop at some point of twice to give them a chance to cool off. Once we reach Vaison la Romaine on the bank of river Ouvėze, 109 km into the ride, we're done. I would recommend to do. your shopping or dining there as we may not find much choices at our destination. Vaison will also be the meeting place with riders who have taken the whimp option to avoid the mountain by going around it. Instead of 2.000 plus meters they will have to do 367 m of cycIing on the 36 km short cut (see map).